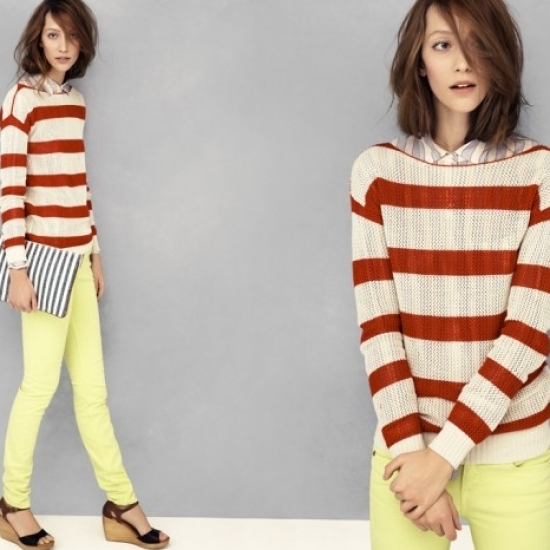 Madewell Looks We Love: Seeing Stripes Lookbook. Love stripes? So does Madewell which has just made the fab pattern part of the Looks We Love series and provides a multitude of alluring alternatives worth exploring in the new season. It's no secret that a little bit of pattern can be a great focal point for most outfits and that stripes have been a constant presence among the outfits endorsed by some of the most important retailers. Madewell has based an entire lookbook around the beloved pattern and the variety of looks endorsed certainly have the potential to dazzle stripe lovers and fashionistas looking for simple yet uber trendy combos in the brand's well known style. From large pieces to more discreet accessories, selecting the placement is the first step towards creating a fabulous look. The area that will be emphasized by the beloved pattern will be the one that stands out the most, so selecting a body area you'll be proud to flaunt is the key for success. This simple yet necessary step is a great confidence booster as it can be the foundation of your whole look. Whether you choose a simple touch or you go bold with a large printed piece, it depends entirely on your comfort zone. Though fun, flirty dresses are always a big hit during the summer season, being fashionable and easy to wear, most of us look for a little structure and proportions when looking for a more polished look. Effortless urban attire is a concept Madewell has managed to break down over the years and give it new fabulous vibes with each lookbook. With versatile and fairly classic pieces and a desire for fun twists, the brand provides fabulous new season options which blend the practical side with the trendy vibes of the moment. Denim pieces, color blocking or mixing stripes are just a few of the ways in which the brand manages to take simple pieces and blend them into fabulous outfits worth replicating. Shorts and sunglasses are other important staples of the new season as well as great style enhancers. With simple, comfy shoes and practical handbags as accessories, the practical side of things is well reflected and the step towards new season fun combos is completed.